FM Corporation originally began as a custom Structural Foam molder providing parts for the furniture, tool, and computer industries. Through the years we have grown to be one of the premier SF molders in the country. We now serve medical, scientific, telecom, industrial, and defense industries to name a few. Whether it’s a few ounces or 75lbs we can accommodate your Structural Foam needs.As we grew with our customers we were also asked to provide Injection Molding to complement our business and serve the customer’s needs. We added machines from 90 tons to 1450 tons in order to be a single source supplier.With FM Corp’s experienced and knowledgeable Engineers we offer Structural Foam, Injection Molding, Gas Assist, Gas Counter Pressure, and External Gas processes. Materials range from inexpensive Polyethylene to specialty Engineering grade resins.So if you have low or high volume runs, simple to difficult parts, or problems with your current supplier call on FM Corporation to help solve your problems. The structural foam process is a form of injection molding that offers an affordable way to gain high strength and rigidity as a structural molded part. Structural parts have a porous foam core sandwiched between two solid outer layers. The foam core is accomplished by introducing an inert gas, such as nitrogen, or chemical blowing agent, which produces CO2, with the melted resin. Once injected into the mold cavity as a short shot, the gas expands and drags the melted resin throughout the mold until it is filled. Because the foam is doing the work there is a low cavity pressure which translates into a low stress part and lower required clamp tonnages.Typical wall thickness for structural foam parts range from 0.150 inches to 0.500 inches with the normal being 0.250 inches. 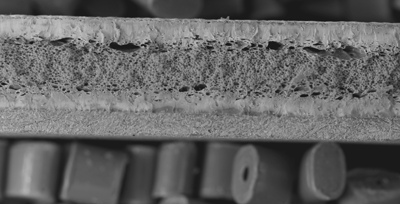 Due to the introduction of the inert gas and internal cellular structure parts can have 10-15% density reduction which helps save on (expensive) resin costs. Thick wall parts can achieve higher weight reduction than thin walls that have been molded solid.Due to the process and high performance resins, structural parts can deliver high strength and rigidity per weight ratio. In addition to increased rigidity to weight ratio, structural parts have better heat insulation, improved electrical, and better acoustical properties. Structural foam offers a big advantage over an equivalent weight of other materials, including metal and injection-molded plastics. Ribs, bosses, snaps, hinges and other features can be molded-in for significant cost savings. Use structural foam parts to reduce overall noise output. 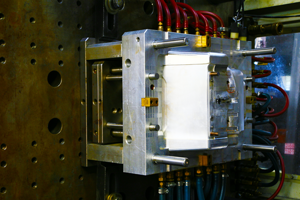 Lower cavity pressure and slower injection speeds greatly reduce wear and tear on molds. The low-pressure structural foam process allows the inclusion of structural ribs and bosses greatly reducing the chance of sinks. Less molded in stress leaves more mechanical strength for function.